If you're looking for a tough-as-nails, yet breathtakingly beautiful, shrub for your yard, rose-of-sharon may just be the answer. It is completely unrelated to roses, but its soft pink blossoms have a similar charm. Rose-of-sharon is a large deciduous shrub in the mallow family. Its flower resembles a tropical hibiscus, though the shrub is much easier to grow and is quite cold hardy. It also bears a close resemblance to hollyhock flowers which grows as an herbaceous biennial, rather than a woody shrub. Rose-of-sharon grows up to 15 feet tall and has an upright growth habit, meaning that it is typically taller than it is wide. It is easily maintained as a six-foot hedge, if desired. It can also be trained as a small patio tree. The dark green, five-pointed leaves have an attractive grayish cast to them and the flower colors include white, pink, purple, blue and red, depending on the variety. One of the most appealing things about rose-of-sharon is its bloom time - the first flowers appear in late summer and continue through fall when few other plants are in bloom. This is a great shrub for a tough spot. Rose-of-sharon is happiest in full sun with rich soil and regular moisture - but it will generally survive (and often thrive) in partial shade with hard, infertile clay soil, and no supplemental water. Other than using it to fill a spot where nothing else will grow, rose-of-sharon makes a great focal point. It will grow very quickly in a pot to make a gorgeous patio specimen or it can be placed in the middle of a large flower bed surrounded by low-growing perennials and groundcovers. 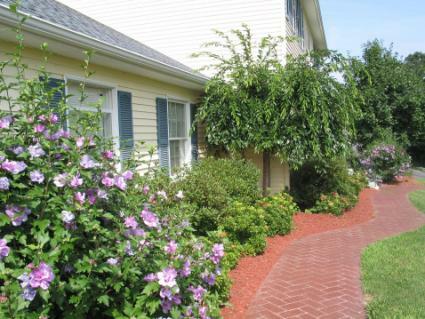 Alternatively, use a row of rose-of-sharon as an informal hedge behind a flower border or along a property line. 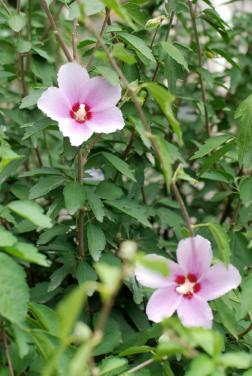 Rose-of-sharon is a very carefree plant. That being said, it will benefit from a weekly watering and will flower more prolifically with an application of bloom booster (high phosphorus) fertilizer applied in late summer. Maintain a layer of wood chips or pine straw over the root zone to keep the weeds down and to conserve soil moisture. 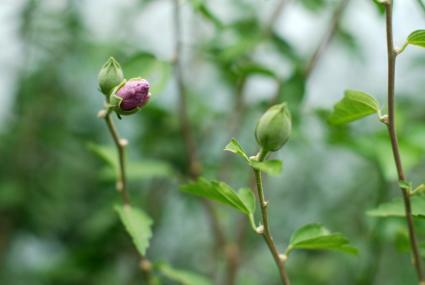 The most likely maintenance activity needed with rose-of-sharon is to control its growth. It can grow 10 feet from the ground in one season and often seeds itself, creating little seedlings that need to be pulled. Prune as needed to maintain the desired height. Many gardeners choose to cut the entire plant back to within six inches of the ground in winter, which results in compact growth the following year and larger flowers. Rose-of-sharon has a tendency to get leggy, so cutting it back hard at least every few years is a good idea. Aphids, white flies and powdery mildew can show up on rose-of-sharon, though these are rarely a serious problem. Aphids and whiteflies can be kept under control with a stiff blast of water to dislodge the insects from the infected area, or an insecticidal soap can be used to treat severe infestations. Powdery mildew is often a sign that the plant is not getting enough sun and air circulation. 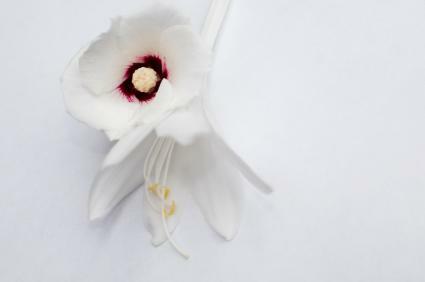 There are numerous named varieties with different flower colors. These also have the added benefit of not seeding themselves in the landscape. The Arbor Day Foundation is a non-profit organization that supports community tree planting that offers one to 1.5-foot rose-of-sharon plants for under $10. Brighter Blooms Nursery offers five to six-foot tall rose-of-sharon plants already trained into a tree form for between $30 and $60, depending on the variety. To really blow your friends away, try the 3-in-1 rose-of-sharon from the Michigan Bulb Company - they've grafted pink, white and blue-flowering varieties onto a single bush which typically costs are $15. Rose-of-sharon is a dream come true for gardeners - it is stunningly beautiful and truly low maintenance. It is fast-growing and usually one of the least expensive plants for its size, making it an excellent choice to fill large holes in the landscape on a budget.